Many people think of February 14th as the day of love (Valentines Day) but it is also International Book Giving Day! 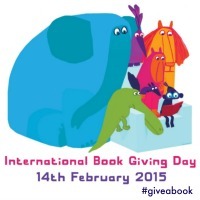 International Book Giving Day takes place on 14th February each year. The aim? To get books into the hands of as many children as possible. International Book Giving Day is a 100% volunteer initiative aimed at increasing children’s access to and enthusiasm for books. 2. Celebrate International Book Giving Day by giving a child a new, used or borrowed book. 3. Leave a Book in a Waiting Room or Lobby.Choose a waiting room where kids are stuck waiting and there are few to no good books available. Purchase a good book, and deposit your book covertly or overtly in your waiting room of choice. The goal here is to spread the love of reading to kids, so choose a fun book, nothing controversial. 4. Donate a Book.Wrap up a box of children’s books that your kids have outgrown and get them in the hands of children who could really use a book or two. Donate your books to your local second hand store, library, children’s hospital, or shelter. Alternatively, donate your books to an organization working internationally to get books in the hands of kids, such as Books for Africa. Click link to download .pdf! Show your support for International Book Giving Day and invite others to celebrate by adding a badge to your blog or website! Go here for International Book Giving Day badges and details.